Even though Facebook at Work looks identical to a person’s personal Facebook, it’s meant solely for communicating with co-workers, which could make users think twice about what they’re posting. “People will be more careful about what they post because they know it’s going to be surveilled. There’s also probably a fear by some people that you don’t want to use Facebook too much in the workplace because you’ll be perceived as not doing your job,” said Gloria Mark, an informatics professor at UC Irvine. Read the full story on the San Jose Mercury News website. Department of Informatics Chair André van der Hoek will be speaking at the Southern California Society for Information Management (SCSIM) Fall Event: “The Southern California Disruptors—How Startups and the New Innovation Culture in Southern California are affecting IT” on Sept. 30 at the Long Beach Marriott. As the head of the UCI Software Design and Collaboration Lab, van der Hoek is part of a three-person panel that will relate their applicable experiences crucial to participating in the new business environment developing around us. Read the full story on the L.A. Times website. She says user engagement can be specific in nature to a particular platform, so people who actively tweet about a candidate or campaign may not be as willing to use to platform to turn over cash. “So I think this is an interesting play to see if people will put their money where their mouth is,” Ito says. Read the full story on the Marketplace website. Chancellor’s Professor of Informatics Paul Dourish was named a 2016 Miegunyah Distinguished Visiting Fellow to spend time at The University of Melbourne’s Interaction Design Lab. According to the website, the Miegunyah Distinguished Visiting Fellow program enables overseas scholars of international distinction to make an extended visit to The University of Melbourne and contribute to the university’s academic, intellectual and cultural life. The fellowships are awarded annually, following an application and selection process that begins with nominations from University of Melbourne faculty. During their time at the university, fellows are required to present lectures, be available for staff and student consultations, stay engaged with research, and prepare a report at the conclusion of their visit. 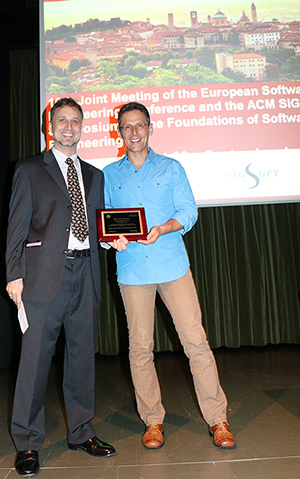 Associate professor of Informatics James Jones, along with co-authors Mary Jean Harrold and John Stasko, received an Impact Paper Award from ACM’s Special Interest Group on Software Engineering (SIGSOFT). Their paper, “Visualization of Test Information to Assist Fault Localization,” presents a color-coded visualization technique to help locate errors and faults in software. The paper originally appeared in the 2002 Proceedings of the 24th International Conference on Software Engineering (ICSE). Read the full story on the Benzinga website.